Get out the birch twigs and the cat-o-nine-tails - after yesterday's (and today's) snow chaos and general city-wide collapse, it seems to be time to stop making snowmen and start the recriminations and flagellations. So why-oh-why-oh-why did London grind to such a halt? A war of words between TfL and London councils about gritting the roads has been going on since yesterday morning. The Highways Agency grits / salts motorways and dual carriageways, TfL does other main routes in the capital and the boroughs do the rest. Councils are trying to dodge the bullet by saying the snow came down too fast for the gritters to keep up. But others are digging their claws in. Ken Livingstone, interviewed on Channel 4 last night, voiced the thought that because gritting needed to happen on a Sunday (ahh, overtime costs), councils thought "they'd chance their luck". Slap! The economising accusation is coming in again from the papers. Bang! Some councils say they had to bail out others, and TfL are blaming councils for not gritting roads outside bus depots. Wallop! The knives are out for train operators too. Fingers are pointing at the "major event exemption" clause in their contracts - no season ticket refunds for yesterday. So, the theory runs, why would they bother running any trains? 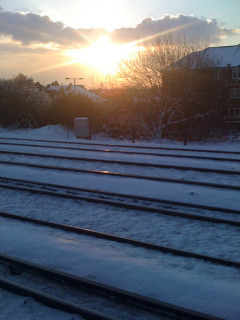 Comparisons are made between the 1987 South-East snowfall, when the trains managed to run on the same network. Ouch. Of course, it's hard to run trains without any staff, who couldn't get into work because the roads hadn't been gritted... whose fault was that again? Cutback Britain is also being blamed for rail failures. The third rail electrification system is a "cheap" option that gets buried in a few inches of snow - not just a mammoth dump like this week. TfL and Network Rail are taking a bashing for only having heaters on the busiest junctions, leaving the rest of the points to freeze up. But are we prepared to pay more for our tickets to get better infrastructure? Ho hum. We go through this every time there's snow of course, and nothing ever changes. We're so used to living in a temperate climate that extremes wig us out. Was yesterday an understandable reaction, a catastrophic planning failure or was it, as hinted in a number of places, 'elf and safety gorn mad?